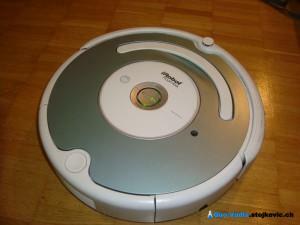 Homy & Roomba – Quo Vadis ? 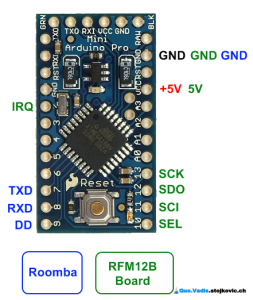 I went through a lot of interesting stuff on this subject (HOW TO – Make a Roomba Serial Interface, Controlling A Roomba with an Arduino, DIY Roomba USB interface cable, New Roomba Prototyping Cable for Arduino, Arduino Robotics Project, …), learned a lot, and figured out how should I proceed with my project. 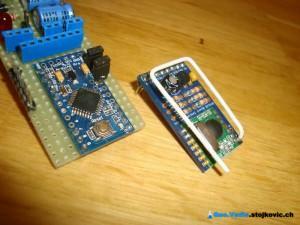 The idea was to use Arduino Pro Mini as a controller that will communicate to Roomba using SCI protocol. Since Roomba SCI port works on 5V, I went for 5V variant of Arduino in order to avoid necessary driver between these two. Then, in order to be able to control the unit from our small home automation system it was necessary to attach a 868 MHz radio module to Arduino. 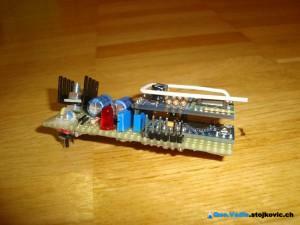 The central system uses JeeNode as a radio communication hub, so the choice was RFM12B Board from JeeLabs. 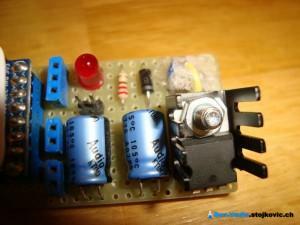 This board is based on HopeRF‘s RFM12B radio module and can be used in 5V setups. After couple of weeks, all of the necessary components had arrived. I don’t need to mention that in the next couple of days I was spending all of my free time on this interesting project. Roomba module had to be connected to Roomba and independent on external power source, so I put a simple voltage regulator block that will convert 15V coming from Roomba PWR pin to 5V that was needed for Arduino. 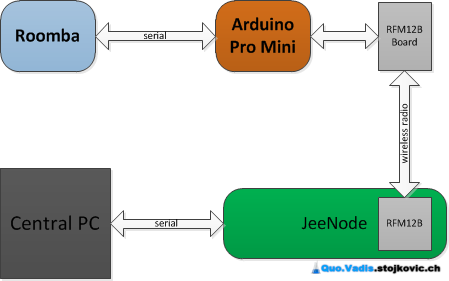 The idea was to use JeeNode connected on the central PC as a “proxy” for sending commands to Roomba. After hours of programming, testing, debugging and recharging Roomba (:)) outcome was Roomba.pde that runs on Roomba module, RoombaProxy.pde that runs on JeeNode and Roomby that runs on the central PC. Both sources and binaries for Roomby are available for those who are interested. As an extension of the PC control software, a web-service endpoint was opened in order to enable iPhone control of whole system.